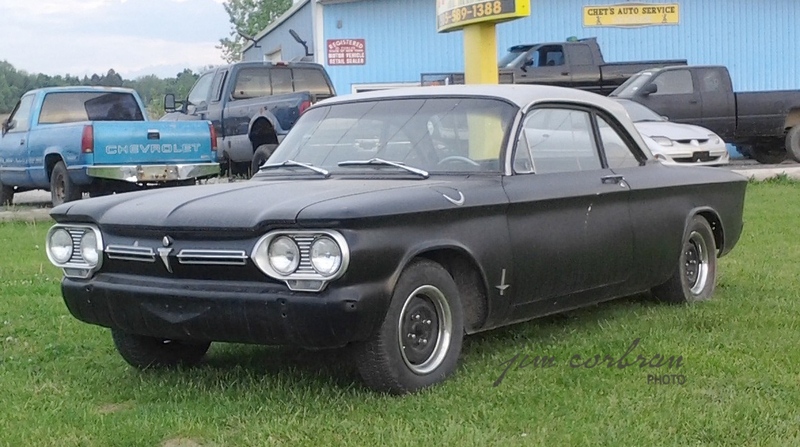 This 1962 Chevy Corvair Monza club coupe looks like it might be in the process of a restoration. Or, maybe it’s already done! One never knows, as we all have our own ideas of what a classic car should look like. It’s amusing to see some of the negative comments posted on social media when someone puts up a photo of their car is a state like this one. Lighten up already! If you don’t like the way this one looks, buy one of your own and do what you like with it. The ’62 Corvair line was also available as one of GM’s smart-looking flat-top four-door sedans and a station wagon, as well as a convertible (for the first time). The Greenbrier Sports Wagon (van) was also, for some reason, badged as a Corvair (its only tie seemingly the rear-mounted engine). Saw this one a couple of summers ago in Albion.